This question is about the mapping between the angular position of the focusing ring and the focusing distance. This mapping could be anything but the design of prime lenses seems to be such that a fixed DoF scale (e.g. engraved on the barrel) is somewhat meaningful at all focus distances from the lens minimum focusing distance to infinity. I'll clarify with an example and I'll use the DoF values from Points In Focus calculator. at 10': from 7' 9.90" to 13' 10"
For the example, let's assume that the lens has a DoF scale and that the f/8 DoF marks are 10 degrees off the center. That means that the distance markings on the focus ring should be positioned so that there is 10 degrees between 7' 9.90" and 10' (10 degrees for 2' 2.10"). There should also be 10 degrees between 26' and 100' (10 degrees for 74'). Are there lenses where the distance markings on the focus ring (besides inaccuracies) would show a different behavior and lead to the DoF for a given aperture having different angular range at short focusing distance and at long focusing distance? For instance, on that 50mm lens, having only 5 degree from 7' 9.90" to 10' but 20 degrees from 26' to 100'. I am asking this question because it seems to be a very strong constraint on the design of the lens, particularly at a time where the DoF scale has become unnecessary on most cameras and in most situations as there are other (better?) options when needed (e.g. visual inspection of the zoomed image on the back of the camera, taking multiple shots, etc.). Without that constraint, would it be easier to design cheaper or lighter focusing elements? Would it be easier to design lenses with a shorter minimal focusing distance? This answer will cover a lot of background information before getting to the point of the question. If one wishes to skip the background information, please proceed to below the divider. Focus distance and depth of field scales on lenses were developed at a time when the cameras that used those lenses did not offer through the lens viewfinders. They give an approximation of what will and will not be considered acceptably sharp enough to be considered "in focus." Over the years, what we consider as "acceptable" has changed significantly. Any estimation provided was better than nothing when one had no way to see through the lens to determine what was and what was not in focus. Many of the scales on such lenses were surprisingly accurate within certain constraints and provided great benefit to photographers who used them well. Since many photos created using such cameras were 'contact prints' that were the same size as the medium format negatives from which they were printed, the display size could be assumed to be the same as the size of the negative and thus depth of field calculations and indexing could also be made with a fair degree of certainty. With the rise of 135 film (35mm) exposed horizontally in 36x24mm rectangles as a popular format, the assumption of contact prints was abandoned and what became known as the "standard" print size was an 8x10 inch print viewed from a distance of 10-12 inches by a person with 20/20 vision (Zeiss assumed 20/15 vision). The depth of field scales on most all lenses made for 35mm cameras assumed such a "standard" print size. If one where taking a photo they planned to print at, say 16x20 inches, one knew to halve the width of the DoF scales printed on the lens to account for the higher (double) enlargement ratio needed to produce a 16x20 print from the same negative size as the enlargement ratio used to produce an 8x10 print. So as photography moved from large negative sizes and contact prints to smaller negatives and enlargers, the DoF scales on lenses became less relevant because the same scale could not be accurate for different print sizes made from negatives of the same size. As photography and the tools used to do it progressed, the ability to see a very close approximation through the stopped down lens of what would be captured by the camera made DoF scales even less relevant. With the explosion of digital photography and the multitude of different format sizes that often use some of the same lens mounts, as well as the widely varying ways in which digital images are viewed, today DoF scales are pretty much meaningless for most applications. The same image viewed on a 6" phone screen or a 10" tablet will have a significantly deeper DoF than when that image is viewed at 100% on a large monitor. When we view a 24MP image at 100% (zoomed in so that one image pixel equals one screen pixel) on a 23" HD (1920x1080) monitor, we're looking at part of a roughly 60x40" enlargement! The second through sixth factors above can all be summarized as the total magnification used. All of theses things combine to define how blurry something can be before our eyes see it as a blurry circle instead of a singular point. Most prime lenses that used mechanical helicoids to move the focusing elements of the lenses had grooves in the helicoids that were straight lines cut into the surface of a cylinder. As the helicoid was rotated, the amount of change in focus distance per degree of rotation was not linear, but it was fairly constant along a well defined logarithmic scale determined by the angle of the groove with respect to the optical axis of the lens. Thus, as long as the distance scales printed on lenses were spaced using the same logarithmic scale as determined by the angle of the helicoid groove, things worked out closely enough to be useful. I've never noticed any such prime lenses. But then I've never looked particularly critically at the distance/DoF scales on most prime lenses I've used. When I started doing photography TTL viewfinders and DoF preview buttons were already commonplace. Curves visible on the parts of the barrels of zoom lenses that were exposed as one zoomed the lens were fairly common. With the emergence of lenses that do not use helicoids to move the focusing elements of lenses, such as some 'voice coil', 'linear', 'electromagnetic', or 'nano USM' focusing motors, it is now possible to design smaller and lighter lenses. But it is not really due to being able to reduce the weight of the actual lens elements used to focus. Rather, it is due to the reduction in size and weight of the mechanisms used to move those lens elements. As to minimum focus distance, the type of mechanism used to move the focusing elements has no bearing on that, assuming the maximum available amount of movement determined by the mechanism used is not the limiting factor. It's still all about the optical formula and the distances involved. For any particular optical design, the focusing elements must have room to move further in a lens with a shorter MFD than in a lens with the same optical formula but with a longer MFD.¹ For lenses with focusing elements placed in the front of the lens, how far the barrel is allowed to extend is usually the limiting factor. For lenses with focusing elements placed somewhere inside the lens behind the front lens elements, the amount of movement the focusing elements can do before being constrained by the location of other lens elements in front of or behind the focusing group is often the limiting factor. LEMs (linear electromagnetic motors) give lens designers some freedom they haven’t had before. 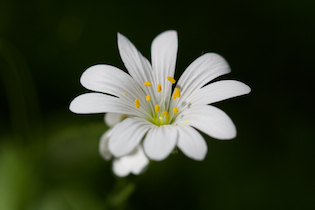 The focusing elements can be put inside a zooming group. More than one element in the lens can move for focusing or compensation (this can be done to some degree with helicoid AF systems, too, but it could be easier and more flexible with LEM motors). Such improvements allow compensating elements that can preserve the lens' peak optical performance over a wider range of focus distances. 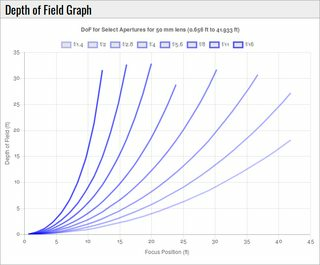 Whereas in the past lens designers might have had to choose between optimizing a lens for closest focus (macro lenses) or infinity focus (telephoto lenses), they can now maintain higher optical performance over a greater range of focus distances. ¹ Assuming both lenses are designed to be able to focus on infinity as well as their respective MFD. There are macro lenses that can only focus at the MFD with no longer focus distances possible. Depth of field on-line computers, printed tables, and most all related stuff, are only guesstimates. These hopefully define the span behind and after the point focused upon, which we trust will be sharply defined. The truth is, perhaps --- perhaps not. First to answer your question – all lenses are not created equal. We have yet to make one that delivers a truly faithful image. Good lenses mitigate but do not eliminate aberrations. There are 7 major aberrations that plague and degrade. The lens maker tries to mitigate each. Because of budget, skill and craftsmanship, all lenses are not created equal. Therefore some will perform narrowly as predicted and some will disappoint. Size of the circle of confusion (specified diameter used for calculations). In other words, depth of field is a calculation based on numerous assumptions that may or may not be applicable. The key value is the size of the circle of confusion realized on the final image. All lenses fracture the vista being imaged into countless points of light. These hopefully tiny points never materialize as points (dimensionless). Each shows up as a diffused circle, thus the name “circle of confusion”. For an image to be preserved as tack sharp, these circles must be about ½ mm or smaller when viewed from standard reading distance. When depth of field tables and charts are produced, a lot of the aforementioned factors are unknown. That being the case, it is industry standard to decide in advance a likely diameter that will return satisfactory results. We are talking about the circle size projected on film or digital sensor. Most charts and tables divide the focal length by 1000 and use this value. Thus for a 50mm lens, the depth of field calculations will be based on 50 ÷ 1000 = 0.05mm. This value allows 10X magnification, to perhaps make an 8x10 inch image to be enjoyed at your typical viewing distance. The circle size becomes 0.05 X 10 = 0.5mm (this is the ½ mm specification talked about above). For critical work a smaller circle of confusion is used. Perhaps 1/1500 of the focal length or ever 1/1750. Many other considerations – it’s the residual aberrations that sour the milk. What you describe is not a "constraint" on the "design" of the lens. Rather, it's a consequence of physics. The lines in the DOF graph from Points in Focus curve because the scales are linear. The curved lines indicate that the increase in DOF accelerates as distance increases. If you look at the focusing scale on a real lens, you'll see that it is not linear. Combine the non-linear change in distance with an accelerating DOF and you get something similar to the markings you see on physical lenses. Every lens I've ever seen with a DOF scale works this way. 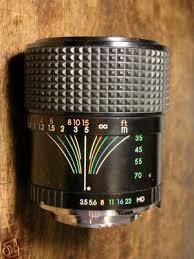 Some old zoom lenses have curved DOF lines that correspond with the change in focal length. This also is a consequence of physics, not lens design. This mapping could be anything... Without that constraint, would it be easier to design cheaper or lighter focusing elements? Would it be easier to design lenses with a shorter minimal focusing distance? The mapping itself has nothing to do with optics, but movement of the relevant focusing mechanisms. The simplest design, linearly translates rotation with lens-element movements. The lens element movements are non-linearly related to focus distance. To linearly translate rotation to focus distance would require a non-linear translation from rotation to lens-element movements. Making the change in a lens that has distance and DOF markers would require introducing more complicated mechanics, perhaps a number of large, oddly-shaped gears. Great for steampunk cosplay, not so great for manufacturing, weight, and cost. While the translation change could be done easily in modern cameras, they would do so via electronic control of the focusing motors, not by changing lens design. Some cameras, such as the FujiFilm X-T3, have drive-by-wire focusing systems and allow switching from non-linear to linear mappings between focusing ring movements and distance. The mapping change is performed by the camera processor and electronic control of the focusing motor, not by changing the lens design. 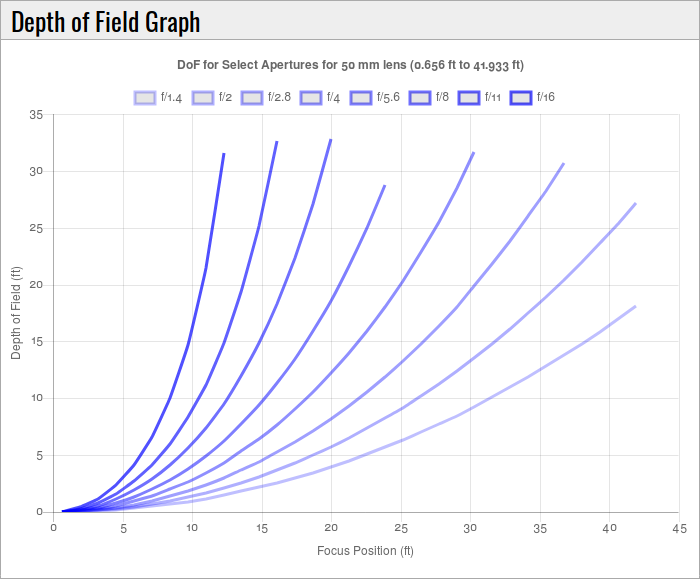 The physical relationship between lens element movements and focusing distance remains the same. Lenses for such cameras do not have distance or DOF markers. No, the angle can change when you focus closer or further. This is because the lens elements don't necessarily have to move linearly with the rotation of the focus ring. Any relation can be chosen, even with a traditional heliciol design. If a designer makes the lens elements move faster at a certain focus distance, then the angle between the DOF markers has to change. Not the answer you're looking for? Browse other questions tagged focus depth-of-field lens-design or ask your own question. How does a focus ring bring a subject in or out of focus? If I select lenses to give the same framing on APS-C and full frame, would I get the same DoF at the same aperture?